Walking into the immaculate family compound of Teja House, you feel it’s a little more special than most. Average rating 8.8 from 78 reviews. The antique motorised pushbikes propped against the generous cane lounges are hints of the traditional, stylishly mixed with the modern. Teja House offers hotel-style comforts in air-con rooms with choices of either traditional or deluxe modern style built within the small family home. We love the generous and ornate outdoor living areas of the traditional styled rooms, however the interiors are quite dark, as windows are wooden shuttered; the modern rooms are glass-fronted and light-filled. Rooms are tiled and shiny clean, with comfortable beds, and some rooms fitted with flatscreen TVs with cable channels, a safe and minibar (check facilities on booking as they vary from room to room). Smart modern decor uses a pallette of neutral browns and beige, but not so neutral that it’s bland. Tiled hot-water bathrooms are spotless, some with glass-screened showers, others more “wet style”. However there is not much space in any for your toiletries. All rooms offer a furnished private terrace — some more private than others. If you prefer more solitude, go for an upstairs room. 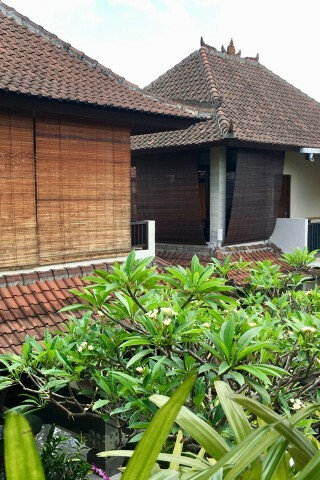 Teja Homestay is in an excellent central location on Jalan Hanoman. Rooms are set back in the peaceful compound and we couldn’t hear any traffic noise, however friendly staff warned us that sometimes you can hear neighbouring dogs and rosters — bring earplugs. Also note that Teja Homestay’s website is a little out of date, and rooms have been renovated since the photos were taken. If you are looking for something a bit upmarket, but still with the friendly ambience of a homestay, Teja Homestay is a good choice. There is no swimming pool at Teja Homestay, so if that’s a priority, try Fibra Inn on Jalan Monkey Forest, which has a lovely pool within a traditional family compound setting. Alternatively, the delightful and spotless homestay Jawi House on a lane off Jalan Monkey Forest doesn’t have the same leafy compound (nor a pool), but you’ll experience traditional hospitality staying in a family home. Check rates at Teja Homestay on Booking.com.